When traveling around Madrid and Barcelona, I recommend bringing along your own talented architect who can help you fully appreciate the beauty of these well-built Spanish cities. Most especially, you can feed off the architect’s bubbling excitement at the chance to see the works of the mad genius, Antoni Gaudí, in person in Barcelona. Lauren and I soaked up the enthusiasm of our personal architect, the Baroness. She “oohed” and pointed as we “ahhed” and gaped all through Parc Güell, La Sagrada Familia, and down the Passeig de Gracia. 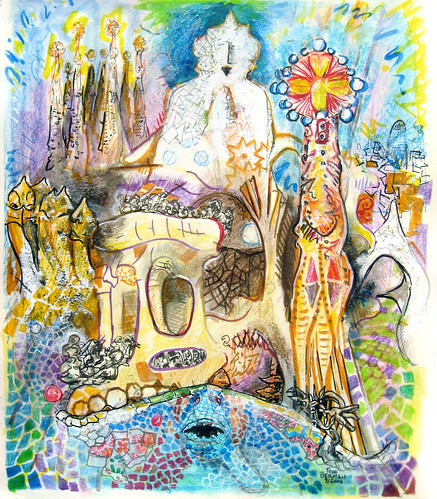 The Baroness made extra sure that I would study Gaudi’s architectural forms closely by commissioning me to draw her a picture based on his works. You’re right, Baroness. Gaudi was a master. I just wonder why more architects haven’t copied his whimsical organic style. I found his work tremendously inspiring. Thank you for giving me this art mission. I wish only that the Gaudi sites were managed better. Lauren and I were appalled to find that the gorgeous curves on the roof of La Padrera are surrounded with a cheap and ugly gray chain link fence. I understand the need for a railing, but especially considering how steep the admission fee is, whoever manages the site could easily have put in something that would not have detracted as much from Gaudi’s work. I took some artistic license and left the fence out of my art. I also left out the hordes of tourists. Thanks T to the odd. Suuuuweet! Can’t wait to get it.